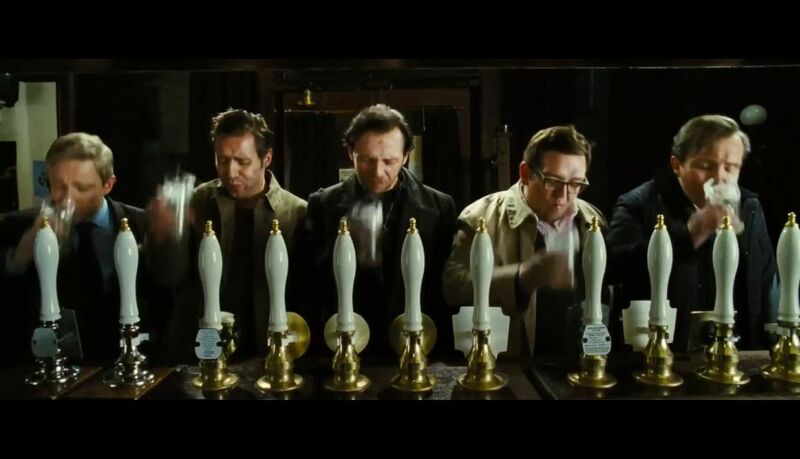 “The World’s End” feels like a grand last hurrah, a victory lap for those “Hot Fuzz/Shaun of the Dead/Spaced” mates Simon Pegg, Nick Frost and their writer/director-partner-in-crime, Edgar Wright. A rollicking, drunken romp through beer, weepy co-dependency and alien pod people conspiracy theories, it allows these no-longer-lads one last chance to be lads — playing guys who have aged out of getting drunk and hitting every pub in town, but trying to recapture that past. That’s what Gary King (Pegg) wants. We’ve met him recalling one epic pub crawl, “the Golden Mile,” from his youth — 12 pubs in Newton Haven — all in one night. Gary “The” King tells this tale at rehab. But that gets him to thinking. He and his four mates (Frost, Martin Freeman, Paddy Considine and Eddie Marsan) never got from “The First Post” (a pub) to “The World’s End” (the twelfth). Even though they’re all 40somethings, Gary rounds them up and somehow convinces each to join him for one last shot at glory. Is it? Can a car salesman, a realtor, a lawyer and contractor revive past sudsy glory? Can they forget the reasons they fell out with Gary — who hasn’t changed wardrobe, cars or drinking habits over the decades? “I haven’t had a drink in over sixteen years!” Andy (Frost) sneers. And just as the alcohol-as-truth-serum starts to kick in and people reveal their failings and disappointments, something sci-fi happens and they’re having to brawl their way from one pub to the next for their very survival. Wright stages the nightmarish night of drunken fights with not-human barflies with skill. But this is a movie that floats by on dazzlingly silly banter and well-slung slang. A legendary encounter with two blondes with a redhead in between was “a marmalade sandwich,” a random line from Shakespeare’s “A Winter’s Tale” about a bear exiting morphed into their “time to leave” catch-phrase. Each character faces a moment of truth from his past, some of those moments revolving around the sister (Rosamund Pike) of real estate fussbudget Oliver (Freeman). When the apocalypse comes, there’s no place better to ride it out than in your friendly neighborhood pub. MPAA Rating: R for pervasive language including sexual references. Credits: Directed by Edgar Wright, written by Simon Pegg and Edgar Wright. A Focus Features release.